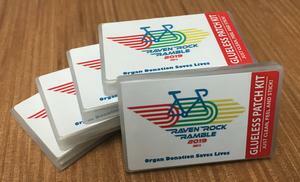 One of the objectives of the Raven Rock Ramble is to increase awareness of the importance of organ donation (see Why ride). 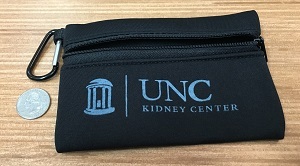 To that end, you'll receive a special gift if you have agreed to be an organ donor (indicated by a heart on your driver's license). If you're not already an organ donor, you can register here. You can check your organ donor status on the Riders page. You never know when you'll need to patch a tube, whether it's yours or a fellow rider's. The Raven Rock Ramble glueless patch kit will keep you prepared with 6 glueless patches and sandpaper to prep the spot. Stash the kit in your saddle bag and you'll be ready to save the day. Back by popular demand! It's the JerseyBin "Big Bin" waterproof pouch, big enough to hold a large phone like the iPhone 7 Plus and similar. It will keep your phone safe and dry, and you can even operate your phone while it's in the pouch. The Big Bin retails for $8.75 on the JerseyBin web site, but it's yours for free if you're registered as an organ donor. Sometimes you just need to be able to conveniently and safely carry a few small things. A ditty bag does just that! It's neoprene, so it protects what's inside, and it has a carabiner so you can attach it to your cycling bag or anything else. You'll probably find more uses for it than you expect. Ever get your sunglasses splattered with so much sweat you can barely see? Or, need something to carry and protect your expensive Garmin computer? This year's special offer is a handy microfiber pouch that can be used for sunglass storage or cleaning, or any number of other uses. The special offer for 2015 is very handy. It's a JerseyBin waterproof pouch, big enough to hold an iPhone 5, or cash and ID, or anything you want to carry with you and keep dry. 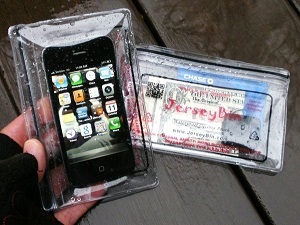 If you were to get caught in the rain with an unprotected phone, this could save you hundreds of dollars! The mid size retails for $7.30 on the JerseyBin web site, but you'll get one free if you're an organ donor! OK, this is cool. This year our special offer is a handy carabiner that doubles as a bottle opener, something every cyclist (and everyone else, for that matter) can use. Now you need never be unprepared to enjoy your favorite CBC tasty beverage! For 2013 we have a 15x17 terry cotton sports towel, as pictured above. Here's my favorite way to use this towel: freeze a water bottle half-filled with water. The morning of a big ride, fill the remainder of the frozen bottle with water and stick it in a cooler in your car. At the completion of your ride, when you're really hot and sweaty, douse one end of your towel with the ice water you've stowed and wash down your face, neck, and forehead. Repeat several times, then dry off with the other end. Ahhh - this feels so delightful and gets the sweat out of your eyes. If you have a drive ahead, repeat the procedure with as much of your body as you're willing to expose, then change into dry clothes. This backpack is perfect for cycling in cool weather! Why? If you start in the 40's and the temperatures rise into the 60's, your jacket, gloves, leg warmers and such may be too much for your jersey pockets but can be easily stowed in the backpack, and the mesh construction keeps it light and cool on your back. To see if you registered as an organ donor, see the Riders page. Bank of America has generously supplied a set of emergency preparedness kits, which include a flashlight, transister radio, "space" blanket, and more. There are two options for 2005: a green "Donate Life" wrist band (I wear mine in combination with my yellow "Livestrong" wrist band), or a sports towel such as what was offered last year ( see below). To the extent that I'm able, I'll give wrist bands to folks who received a towel last year, and give towels to riders who don't already have one. Additional green wrist bands will be available at the ride for $1.00 each. This year the special gift is a sports towel donated by Carolina Donor Services. It's an 11x18 inch white towel with their logo on one side. This year the special gift is a magnicard - a credit card size magnifier. Why might you need this? Have you every had difficulty reading a map or cue sheet? If you're past your 30's, are the letters getting a little too small? The magnicard allows you to wear your cycling shades and still be able to read. If you don't need one of these yet then hold on to it - you will. While the magnicard comes with its own protective case, it also fits conveniently in the card slot in the waterproof wallet. This wallet is perfect for carrying identification and cash while you ride. 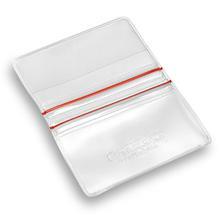 It's made of heavy-duty vinyl and has two waterpoof compartments that are easy to open and seal. It also has a slot for carrying a credit card and the like. The wallet folds in half and easily carries in a jersey pocket.